The school year is at an end, and so with it goes the daily gauntlet of clean uniforms, healthy lunch boxes and school bag packing. Hooray! But don’t get too comfortable - it’s time to get ready for the holidays! While some parents seem to have it all under control with daily itineraries, craft activities and healthy snack foods, for most of us the school holidays represent an daily challenge to come up with fun and engaging activities while trying to keep the kids from going crazy! Here are a few tips to help plan out a low-stress holiday period. Holidays can be draining in a number of ways. Physically and mentally the 24/7 routine can take it’s toll. The other area where you can get drained is financially. From eating out, trips to the movies, theme parks and other activities, the costs can all add up quickly. To help plan out your time look at your budget and map out your ‘big ticket’ items against low cost ‘in house’ activity days. Not only will this help avoid a budget blow out in the first week, it gives the kids a program of activities and experiences to look forward to. Get prepared early on by stocking up for the weeks ahead in all types of consumables. From arts and crafts materials for creative imaginations, to healthy snacks and drinks for whenever required, being stocked up will meant there is always something to do and will avoid expensive and unnecessary trips for hungry tummies. Keep an eye out for shops selling craft kits or experiments, and use your local library for ideas. Work with parents of your kids friends and share the load. Having their kids along with you on your adventures is only adding a small amount of stress for you, but allows them a day of ‘personal management time’. You will appreciate the time when they return the favour. The additional benefit is giving the kids another person to spend time with to break up any boredom. While the appeal of the hypnotic screens and the distraction free child time they give parents is undeniable, we all know that sensible limits on screen time should be adhered to. On house bound days where boredom reigns, have a prepared box of arts and crafts, Lego, games and puzzles for kids to help entertain themselves. After initial complaints you will see the kids get lost in imaginative and constructive play. While the Summer holidays provide a great opportunity for kids to get outside and enjoy some exercise and fun games, keep an eye on the weather report when planning your days. Not only do you need to be aware of Melbourne’s well known ability to change from sunshine to thunderstorms in the blink of an eye, you also have days of extreme heat where outside activities are not safe. If staying inside is driving the kids (and you) stir crazy, look for indoor activities that are not reliant on weather conditions. Activities such as movies, slot car racing and tenpin bowling provide great entertainment in air conditioned comfort. Depending on the age of your kids, school holidays are a great time for them to do jobs around the house/neighbourhood to earn some pocket money or bonus treats. Not only is it a great chance to help tick off some ‘to-do’ items on your list, but it helps teach the kids the value of a days work. Instead of money you can always reward them via treats such as activities or treats such as ‘video console time’. Discuss as a family and plan a big day out for the end of the holidays. Be it a theme park or museum, preferably somewhere they have had their eyes on for some time. Firstly it acts as a great milestone to wrap up the holidays and get ready for the new school year. Secondly, if planned at the start of the holidays it gives everyone something to look forward to (as well as a subtle reminder during poor behaviour), especially if the budget doesn’t allow for too many big activities. 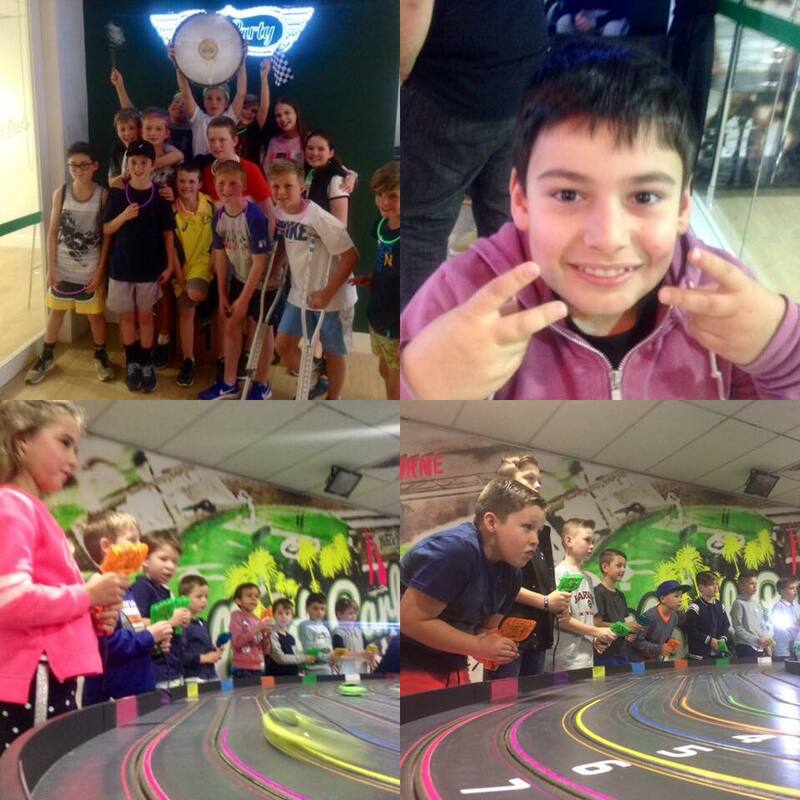 For a great all weather activity for groups of 2 or more, Race Party have two great options. Our 30 minute Burnout sessions are a fully automated race session where guests race slot cars around one of our two 40 meter, eight lane slot car tracks. For a whole day activity our Holiday Drivers Club is a full on racing experience that the kids will love. A five hour day of full on racing action with a racing program testing the drivers skills. Older PostAn evening of fine jewellery, premium wines and fast cars!